I used to come to Ossington to watch movies at the Paradise Cinema. I’d always decide to go at the last minute, and then I’d forget to use the Delaware exit, so I’d wind up hustling the extra couple of blocks west, and missing the first few minutes of the show. Tell me, is the beginning of Reservoir Dogs any good? As for the station, it has a shabby, run-down feel that matches the gritty (but developing) stretch of Bloorcourt Village it inhabits. Hipster alert! Recently, the station began renovations to permit barrier-free access to the subway platform [see update at end]. If there’s anything that I’ve noticed on my transit peregrinations, it’s that the system remains quite hostile for wheelchair users. Most TTC subway stations were designed and built in an era where accessibility was at best not a concern, at worst actively opposed. The Commission has been carrying out a multi-decade long plan to mitigate this deficiency, but incrementally retrofitting everything is costly, complex and challenging. In an environment where basic station upkeep occasionally falls behind at non-priority stations, I’m not confident about the funding assurance to complete these elevator projects in a timely fashion. Keep your fingers crossed. 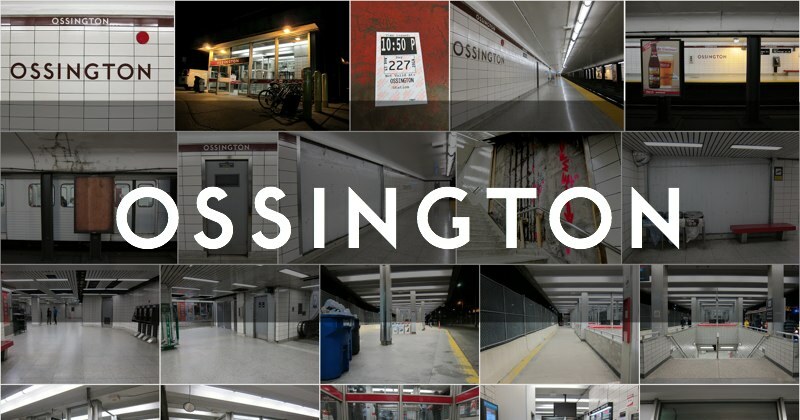 Ossington station opened on February 25, 1966. Since then the station has gone rather downhill, but as part of the elevator installation the station will be getting patched up and will even have some art installed (check out the gallery to see what’s proposed). Here’s to better and brighter days, Ossington! Update: In September of 2016, the TTC removed construction hoarding to reveal... elevators. And an accessible curb ramp at the entrance. It only took 50 years. We love to complain about the rate of progress, but let’s celebrate the small wins, shall we? Finally - an accessible curb ramp from the sidewalk. And a new station sign. In October 2016, Scott Eunson’s whimsical Ossington Particles art piece was installed onto the walls of the station. Ossington Particles injects a (much-needed) mischievous quality. Additional photos of the playful work may be found in the gallery.